Children with high-functioning autism spectrum disorder (ASD) have adept and competent emotional processing skills when viewing their mother’s faces. They are just as “in-tune” with their mother’s feelings and emotions as children without ASD. This finding may indicate greater potential for children with ASD to learn and socialize with people they know rather than with strangers. Although prior studies have assessed the ability to recognize facial emotion in both children and adults with ASD, results have been surprisingly inconsistent. Furthermore, studies in children with ASD have typically only tested using unfamiliar images, with two-types of expressions, “neutral” and “emotional,” and with wide age-ranges. To address these limitations, researchers from Florida Atlantic University’s Charles E. Schmidt College of Science conducted a study in children with and without ASD, ages 4 to 8 years old, using five distinct facial emotions; happy, sad, anger, fear, and neutral, which served as a control. 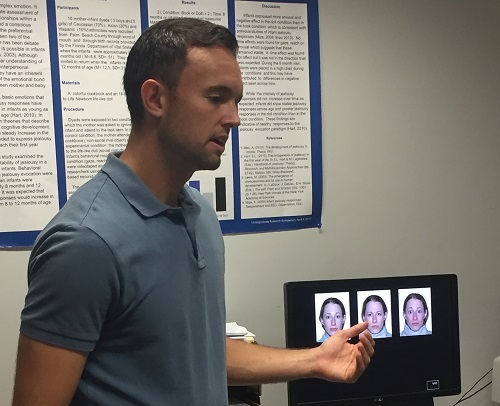 They used facial emotion recognition tasks that featured both familiar and unfamiliar faces. They wanted to test how familiarity influences performance in these two groups of children using a constant familiar stimulus – their mothers. Results of the study, published in the journal Child Psychiatry & Human Development , provide evidence that children without ASD are more proficient in recognizing unfamiliar facial emotion expressions than children with ASD, particularly for negative emotions like fear and sadness. Interestingly, the researchers discovered that children with high-functioning ASD have adept and competent emotional processing skills when viewing their mother’s faces. They are just as “in-tune” with their mother’s feelings and emotions as children without ASD. The two groups of children did not differ in recognizing expressions from familiar faces. Nathaniel A. Shanok, (pictured) lead author and a Ph.D. student working with co-author Nancy Aaron Jones, Ph.D., an associate psychology professor and director of the WAVES Laboratory in FAU’s College of Science, and a member of FAU’s Brain Institute and Center for Complex Systems and Brain Sciences, used five distinct facial emotions for the study; happy, sad, anger, fear, and neutral, which served as a control. Children with ASD are less skilled at processing emotional information, especially sad faces, when they view the faces of strangers. Findings from this study show that children with ASD are perceptive to their mother’s emotions, which may indicate greater potential to learn and socialize with people they know rather than with strangers. “It’s unclear whether the ability of children with autism spectrum disorder to gauge emotional information from strangers’ faces is due to genuine deficits in their processing ability, the indifferent nature of negative emotions, or due to a general pattern of disinterest in negative emotion displays or unfamiliar people,” said Aaron Jones. Shanok, Aaron Jones and Nikola N. Lucas, Ph.D., co-author at Ashford University in San Diego, note that for children with ASD, further difficulties in recognizing negative or complex facial emotional expressions may be due in part to variations in eye contact and eye tracking behavior. Other studies have shown that these children focus less on the eyes and more on other facial areas that are less informative of an individual’s emotional state. This finding explains their difficulty with recognizing sad and other expressions as well as rarely struggling with recognizing happy expressions, as too was the case for the FAU study. According to the U.S. Centers for Disease Control and Prevention, about 1 in 59 children has been identified with ASD, which occurs in all racial, ethnic, and socioeconomic groups. ASD is about four times more common among boys than among girls. ASD is characterized by ongoing social problems that include difficulty communicating and interacting with others, and repetitive behaviors as well as limited interests or activities. Symptoms are typically recognized in the first two years of life and affect the individual’s ability to function socially, at school or work, or other areas of life.